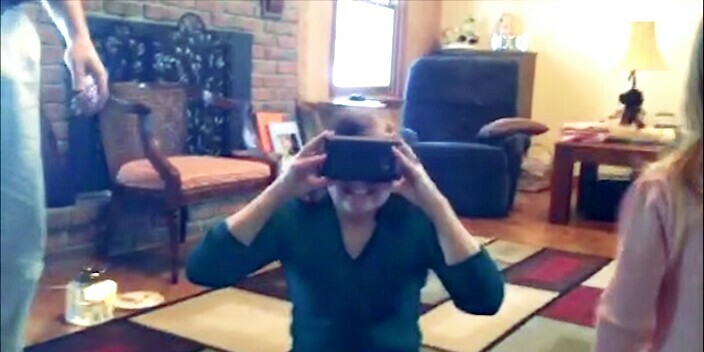 Google Cardboard helps a visually challenged woman to see for the first time in 8 years. This is a major breakthrough for the technology as well as the medical sciences. Bonny, whose vision was impaired due to Stargardt saw her family after a long gap of 8 years. Stargardt is a common eye-disease that causes the vision loss progressively which may eventually lead to complete blindness. Around 25,000 people are estimated to be suffering from the disease. The disease begins with causing damage to the yellowish area, macula that is located around the fovea close by the midpoint of Retina in the eye. People who suffer from Stargardt use certain number of Services to perform their daily activities. Google Cardboard just got itself added to the list of those services. “Night Sight VR Augmented Aid”, an application for Google Cardboard was used to bring back the vision in Bonny’s life. The app captures the surroundings using the rear camera and displays the data in each eye. The Google Cardboard in conjunction with the “Nigh Sight VR Augmented Aid” app can be used to bring the lost vision in many lives. Virtual Reality is known for taking the people to a whole another world. Now, we can also say proudly that it also brings back the lost worlds to the ones who are visually challenged. The history always has a miracle story to tell whenever technology met the medical sciences. This story of Bonny will certainly remain as one such a miracle for the rest of the ages. Let us know in your comments on how technology has made your life simpler. May it be a small silly thing or a big huge thing, we’d like to hear from you.